Does It Exist? You Be The Judge. In 1918 the Boston Red Sox won their fifth World Series, thanks in great part to a young pitching and hitting sensation from the slums of Baltimore, named George Herman Ruth, a.k.a. the Babe, or the Bambino. Following the 1919 season in which the team failed to make the Series, Red Sox owner Harry Frazee sold the Babe to the New York Yankees. The Yankees went on to dominate the game of baseball, not just during the Ruth era, but for decades afterwards, winning a total of 26 World Series since. The Red Sox, who had won five of the first 15 World Series ever played, have never won another since. 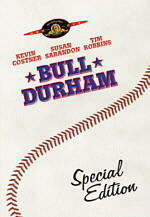 Told with humor in the face of heartache, this acclaimed documentary combines archival footage with contemporary interviews and focuses not on the players who have come and gone, but on the diehard fans who live their lives lamenting what some have come to call "The Curse of the Bambino". Why do we develop our partisan attitudes toward sports teams? A number of factors interfere, but sometimes our loves and hates lack much clear reasoning. Of all teams pro and college, I loathe none quite as much as the Boston Red Sox. I maintain a genuine disdain for the BoSox, so I feel true delight when the team inevitably fails. Curse follows the history of the Sox in a somewhat elliptical way. 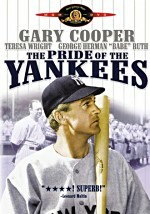 It tells us of the team’s early success, as they won five of first 15 World Series. We then hear of Babe Ruth’s stint with the team and his popularity as well as how owner Harry Frazee sold him to the Yankees after the 1920 season because he needed money for his New York theater. We watch the immediate impact this had on the Sox and find out a little more about Frazee, as the show debunks some myths. The program also covers support for the deal at the time and how Ruth’s behavior caused problems while with the Sox. From there Curse looks at the immense hatred of the Yankees possessed by most New Englanders and we watch some examples of Sox collapses. We examine their failure in 1978 and the infamous one-game playoff with the Yanks that inspired the legend of Bucky “Bleeping” Dent. Some general notes about other failures appear and then we hear about the legend of the curse. We get pro and con comments about how the selling of Ruth caused a curse as well as attempts to erase it. In addition, Curse looks at other issues that caused Sox problems over the years. We hear of the team’s institutional racism throughout the years and its on-going impact. Finally, the program gives us a fairly in-depth view of the Sox’s greatest failure, the collapse in the 1986 World Series. Curse offers a fitfully entertaining program filled with highs and lows. Unusually, some of its strengths also are weaknesses. The fan interviews fall into that category. Curse relies too heavily on these, and they occasionally dilute the impact of the material. We see game footage of significant events, but the program interrupts these for comments, and that often makes them less effective. For example, it’s good to see the Bucky Dent home run, but the show mars the presentation with too many fan remarks. On the other hand, when the interviews work well, they add a lot to the show. The best example comes from the examination of the 1986 Series. The Sox made the World Series three times in my life. I was an infant in 1967, so obviously I have no memory of it. I was eight for the 1975 Series, so I maintain some recollection of it, but not a strong one. 1986, on the other hand, took place in my late teens, and I have a very vivid memory of watching it in my college apartment. My hatred of the Sox was well in place by then; I never liked the Mets either, but I’d root for Satan himself over the Red Sox. I recall the ecstasy I felt when the Sox made that most improbable of collapses. Curse doesn’t show matters from my side of the coin, but its interviews with Sox boosters aptly boosted my memories. I felt like I was back in that apartment watching it take place in front of me. The interviews seemed very vivid and allowed us to get a “you are there” feel, at least from the Sox fan point of view. The 1986 elements are definitely the best parts of Curse. On the negative side, the show doesn’t delve into the team’s history as much as I’d like, and it seems like a scattershot examination. The construction seems awkward, as it flits from era to era without much logic, and it doesn’t follow a logical path. I’d have liked more information about other eras instead of just 1978 and 1986. 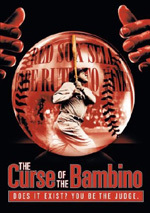 A flawed but generally entertaining documentary, The Curse of the Bambino lacks the coherence to be a terrific show. Nonetheless, it gives us an interesting look at its subject. It seems most suited for non-fans of the Sox, as I don’t think their partisans will get much from this painful walk down memory lane. 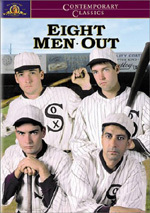 The Curse of the Bambino appears in an aspect ratio of 1.33:1 on this single-sided, single-layered DVD; due to those dimensions, the image has not been enhanced for 16X9 televisions. Picture quality seemed a bit erratic but was mainly good. Within the constraints of the material, sharpness seemed fine. I based most of my opinions on the interviews conducted expressly for this documentary, and they presented decent accuracy and delineation. They never looked terribly detailed, but they appeared adequately concise. Occasional examples of jagged edges and moiré effects occurred, and I also noticed some light edge enhancement at times. Not surprisingly, the archival footage demonstrated some defects. The new shots were cleanest. The image showed sporadic instances of specks and marks in the older shots, though they weren’t too bad. The program demonstrated somewhat drab but decent colors. They varied dependent on the source, but they mostly seemed fairly natural and clear. Blacks were reasonably deep and dense, and the few low-light shots looked acceptably concise. Given the nature of the program, Curse seemed perfectly watchable, but it didn’t offer a particularly strong visual presentation. It should come as no surprise that the Dolby Stereo 2.0 soundtrack of The Curse of the Bambino presented a pretty subdued affair, but it seemed pretty satisfying. The major material from the side speakers concentrated on music, as the score offered very nice stereo separation and imaging. Occasional effects popped up, mainly due to the thunder that appeared in curse-related shots. Those also spread nicely to the surrounds. Otherwise, some light baseball ambience occurred, but the chatty mix largely concentrated on the center. Audio quality appeared perfectly acceptable. Speech was consistently natural and distinctive. I noticed no issues with edginess or intelligibility. The score seemed clear and very well reproduced, as the music appeared warm and vivid. The effects were a smaller part of the mix. Still, they came across as clean and fairly accurate, and the thunder demonstrated nice bass response. Nothing special occurred here, but the audio of Curse was more than fine for this sort of program. No supplements appear on the DVD. That’s too bad, as it could have included some nice baseball and historical footage to expand the subject. As a longtime Red Sox hater, I enjoyed The Curse of the Bambino, as it allowed me to relive that squad’s more humiliating moments. The program suffers from inconsistent pacing and erratic focus, but it remains reasonably informative and engaging. The DVD offers pretty average picture and audio but lacks supplements. With a list price of almost $20 for a 60-minute program and not much rewatchability, I can’t recommend a purchase of Curse, but it merits a rental for those with an interest in the hexed history of the Red Sox.